I woke up this morning and the hostel children were drawing kolam designs on the ground at the entrance to the Workers Home. These are traditional geometric designs done in chalk (colored for special occasions) on the hardened ground which has been splattered with water mixed with cow dung. I have tried on occasion to do them myself, but mine always come out crooked. Once it was the case that kolam designs were done in rice paste, as morning offerings to the ants, signifying the extraordinary respect Indians have for the natural world. I brought and shared a bag of dried organic cherries, so I could tell the story of migrant laborers in the United States, and especially in my home state. There were many tales of what being part of LAFTI has meant for each of the workers. Veerachami is Amma’s righthand man for community organizing and action; Vengopu being the chief administrator. They described this to us as Veerachami being the one who goes to jail, and Vengopu being the one who bails him out. At any rate, growing up in his small village, because of his Dalit status, Veerachami was not allowed to wear a dhoti (the floor- length wrapround cloth that is traditional men’s wear, and instead had to simply wear a small towel that barely covered half his lower length. He was not permitted to wear shoes when walking on the main road. There were entire parts of his village that were off-limits to him, and he wasn’t permitted anywhere near the temple. After he would finish his day’s work as a bonded agricultural laborer, he would have stand outside the window of the landlord’s house and his pay would be dropped to him, because the touch of a Dalit would be polluting. (This landlord is now gone, and I think his house is now owned by LAFTI.) Now he meets with state government cabinet secretaries, calls on the District Collector, has been to Italy with Krishnammal and walked in the Perugia-Assissi Peace March, and is universally respected by all communities. 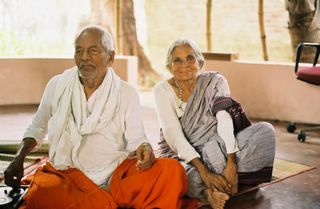 His family is also one that had received one acre of land in Krishnammal’s early land reform efforts, and has now been able to educate his children. Great changes are taking place, but the other reality is more than half the population in the two districts where LAFTI works is below the poverty line (you can think of that has having incomes below $250 a year), and globalization and environmental degradation due to the prawn farms has given rise to a new round of bonded labor. There is so much work yet to be done. I have been helping to serve meals and coffee. The workers’ first sight of me doing this apparently caused something of a shock on some of their parts, as they are used to having the foreigners – all of whom are well-meaning – waited on hand and foot. But this is my house, and I am the host! Lots of chocolate was served today – Belgian chocolate, German chocolate, American chocolate. It seems we all knew to bring chocolate for Appa, but he no longer eats it! So we proclaimed it as presents from Appa to the workers for a job well done.